Visit the Picturesque Village of Qeparo! WE PRODUCE IT ! WE STORE IT ! WE PACKAGE IT ! 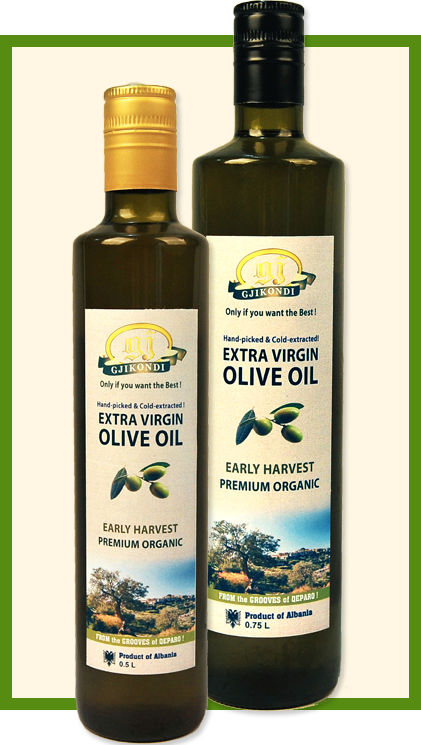 Gjikondi Extra Virgin Olive Oil is a “Certified Organic” product which has been the first-prize recipient in many national and international events. 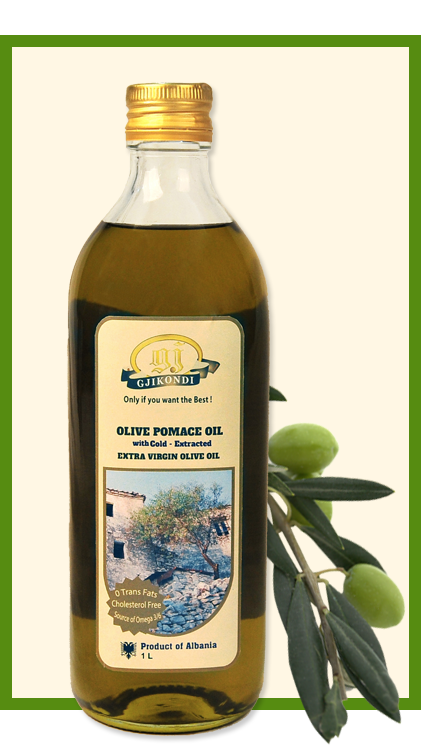 Gjikondi Extra Virgin Olive Oil is hand-picked early-harvested and cold-pressed at low temperatures less than 27⁰C (T<27⁰C) solely by mechanical means, and has low acidity of less than (< 0.4%). This oil is produced from certified organic “Kalinjot” centuries-old olive trees, grown in small and medium size farms, belonging to the families of villagers in Qeparo and other surrounding villages. The Ionian Coast climate with sunshine on 300 days a year and the pristine mountain air, are all major contributing factors of our golden-green colour oil, which give our high quality olive oil its unique characteristic of; olive scent, slightly higher viscosity and texture, rich and strong aroma, and zesty flavour with a gentle bitterness and a progression towards a moderate spice to it with a pleasing balance, which is the result of the high levels of Omega 3-6 and high antioxidants content, essential to good health. The Gjikondi Company is certified HACCP (Preventive System of Food Safety Management in every step of production, storage and distribution of a food product). Currently, our Gjikondi product is sold in several European countries and in North America. Looking forward, our intention is to bring our high quality product to the markets of Middle East. Our mission and goal: To offer our clients an authentic Albanian product of very high quality and the best of its kind in the market. From “Kalinjot” cultivar and used in all types of culinary preparations; has a smooth taste which is light and delicate. 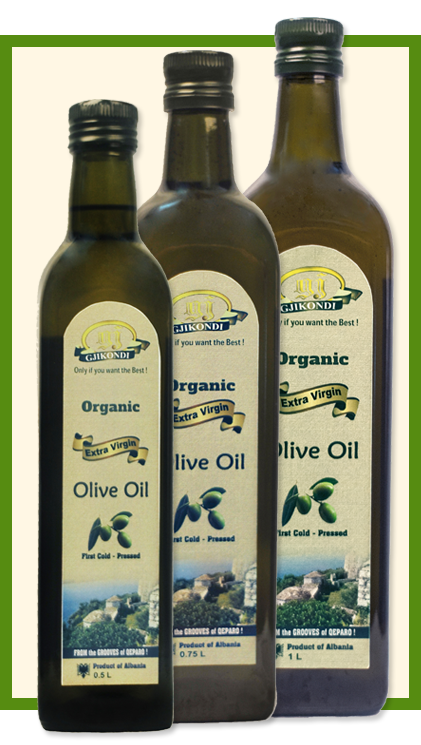 It’s free of Acidity, Cholesterol and Trans Fats; low in Saturated Fats; and Source of Omega 3/6. Bottle: Quadra (clear colour), 1000ml. storage and distribution of a food product. We would welcome your requirements, and we are ready to answer your questions at any time.